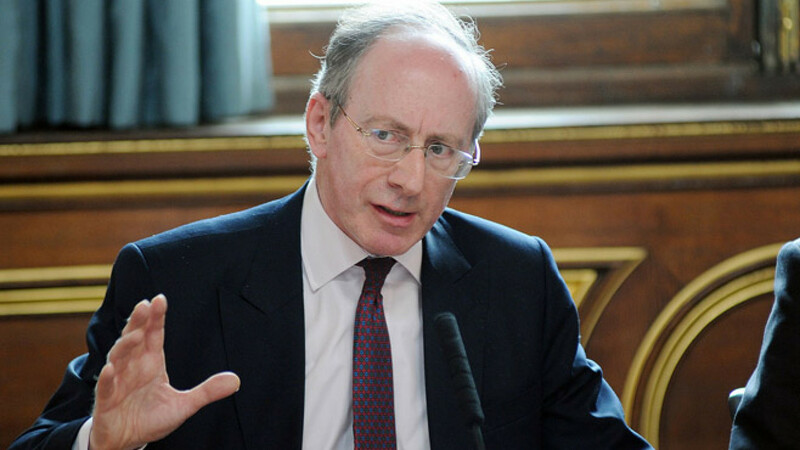 Rifkind was minister at the Foreign Office when Gorbachev came to power. Just over 30 years ago, Mikhail Gorbachev became general secretary of the Communist Party of the Soviet Union. The next day, The Times of London ran an editorial entitled "Mr Gorbachov's Hour" — the British media had yet to learn to spell his name — saying that he could prove to be a man with whom Western leaders could feel at home with more than Lenin's heirs. Almost 30 years later, Britain's Foreign Secretary Philip Hammond struck out at Russia in a speech in March: "We are in familiar territory for anyone over the age of about 50, with Russia's behavior a stark reminder that it has the potential to pose the single greatest threat to our security." Britain's Sir Malcom Rifkind, who leaves the British Houses of Parliament at the election in May, has seen relations come full circle. He was Minister of State at the Foreign Office under Geoffrey Howe in the 1980s, where he was influential in helping change the government's attitude to the Soviet Union and attended Margaret Thatcher's first meeting with Gorbachev. He later served as Defense Secretary and then Foreign Secretary. "The initial interest in Gorbachev was not in someone who was likely to be as radical as he turned out to be — there was no evidence of that at that stage," said Rifkind in a telephone interview. "But we did have a Politburo that was geriatric and the two youngest members were Gorbachev and [Grigory] Romanov, who had been promoted to full member of the Politburo and represented a new generation as the older ones moved on. They would in one form or another be part of the new leadership." Gorbachev quickly made an impression on the Foreign Office at the time, said Rifkind, especially after a short visit to Canada. "People in Canada had been quite impressed by him as having a stimulating personality, an interest in discussing ideas, just being generally easier to get on with than some of the previous Soviet leaders." That helped persuade Thatcher to agree to meet Gorbachev. His visit to Chequers, the British prime minister's country retreat, in December 1984 was groundbreaking, a major step in the thaw between the East and the West. Decades on and relations between the two are at a low point and scarcely a day goes by without a reference to "a new Cold War," but Rifkind doesn't see the situation as a return to the bad old days. 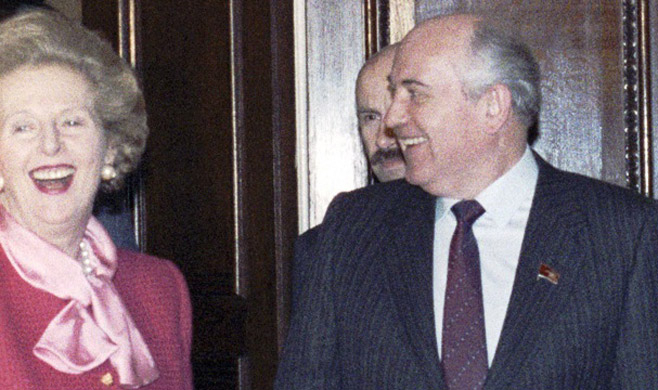 Thatcher and Gorbachev laughing at the Soviet Embassy in London, 1989. "It's not a new Cold War," he said. 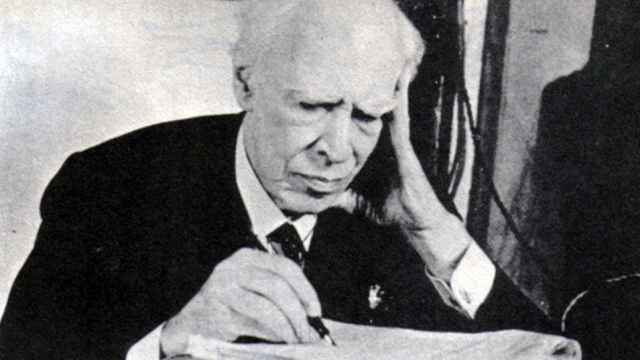 "Throughout the whole period of the Cold War, that was a struggle for global mastery. And not just between two countries and two systems, but between two ideologies. So it was the Soviet Union seeing itself and being seen as a global superpower and it was also a competition between capitalism and communism for economic and ideological supremacy. And it was also Russia as a country expressing its nationalistic aspirations with an empire, Europe's largest empire. If the Cold War had become a hot war it would have been thermonuclear and the possible destruction of the planet. We're nowhere near that at this moment in time." Rifkind understands that President Vladimir Putin is not seeking global power but is nevertheless dangerous because he is destabilizing the part of Europe that he has influence over. "His ambitions are essentially to recreate much of the old Soviet state — not communism. He's not interested in communism. He wants to recreate the Russian empire … by controlling the territories around it and he believes that Russia is entitled to do that. And that is hugely destabilizing for the rest of Europe and that it why it has to be resisted." Tensions in Ukraine have been the flashpoint and Rifkind called the conflict "a crucial moment in the history of Europe," in a speech in the House of Commons in March. But he reiterates that it is not a new Cold War but serious for a different reason: Russia and other countries agreed at the end of the Cold War to respect territorial boundaries, he said "and when we had the Budapest Memorandum signed, which allowed Ukraine to hand over all its nuclear weapons that had been on its soil, part of the deal was a recognition by Russia of the existing frontiers of Ukraine and Russia, which put Crimea firmly into Ukraine. That's the nature of the problem. It's a serious problem, but it's a mistake to compare it with the Cold War, which was over different issues and a different scale." Rifkind says that EU and U.S. sanctions were "useless" at first, targeting only Putin's business allies, but that the further sanctions against the financial and banking industries have made a difference. 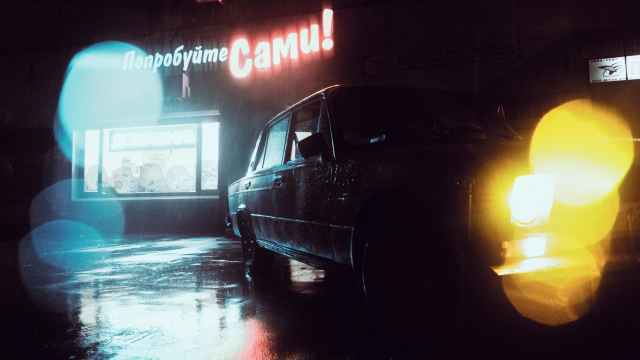 That "has meant that very large swathes of Russian companies cannot borrow on the markets. They have to go to the Russian government and ask for a bailout, which they're getting, but the funds available to the Russian government for bailouts are getting weaker and weaker." Rifkind was, until February, chair of the parliamentary Intelligence and Security Committee, which deals extensively with terrorism and counter-terrorism. This gives him a broader view that sees Russia as not the biggest problem facing the intelligence community. "We still have problems with individual countries, of which Russia is one. But that is a relatively modest part of the overall effort of [British intelligence and security organizations] MI5, MI6 and GCHQ."